No surprise whatsoever. It's a shame. I wonder how much effort and miles driven it took to get all that crap up there. Woulden't it be as easy to go to a dump ? Really angers me to see this crap. Gate it all at the asphalt!! I live outside of the big town of Rainier. Over the past week, somebody dumped an entire "hot tub" right off a main road, just off the entrance to a newer/smaller housing development (maybe 10 homes in there). Such class! It truly amazes me how people can do this.....I just don't get it. I'd really like to hear (maybe not) somebody's reasoning for dumping their garbage, chunks of furniture, etc. on public or private ground when for a nominal fee.... they can drive to a dump or transfer station and get rid of it. Unfortunately in these idiot's minds, that nominal fee means less meth , pot, alcohol, or all of them and that is just "too high a price to pay.". Thankfully good folks spot these az hats occasionally and call them in. Tougher prosecution and sentences vs slaps on the wrist for drug charges would help the situation . 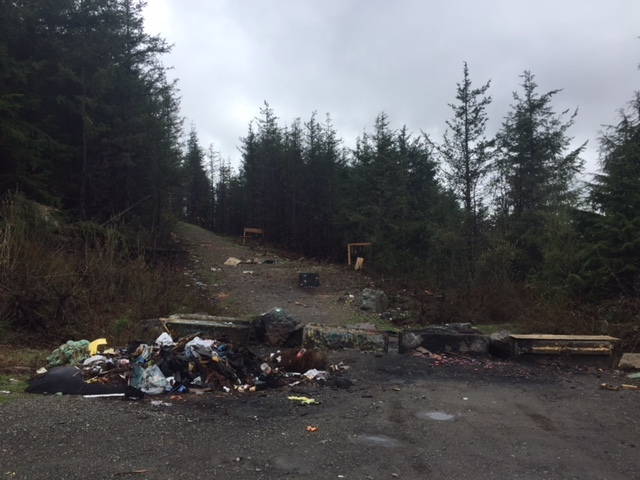 The amount of money that gets spent cleaning up these dump sites is astronomical, especially old campers, tires, and such.... Everybody generates roughly the same amount of garbage, why are dumps not free??? I feel like more tax money gets spent cleaning up garbage then it would to just cover dump fees. I know large city's have found it saves them money to have large dumpsters around, instead of having to pick up old mattress and tv's and then putting them in a dumpster themselves.